Price $10 Value $25 View it! The Kershaw Offset 1597G10 features a textured G10 handle for good grip. The Metal Injection Molded 440C blade has been coated with tungsten dlc to give it a smooth matte gray finish. 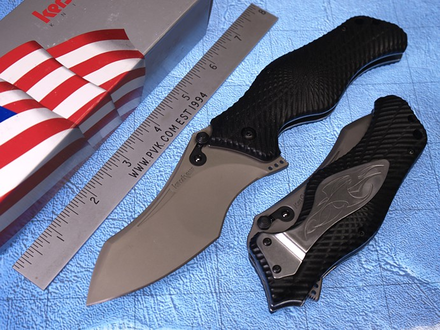 Kershaw implemented double-pumper torsion bars to speed up the deployment of the blade on this 8.5 oz knife. The Offset was voted 2005 ‘Overall Knife of the Year’ by Blade Magazine for plenty of good reasons. This Kershaw Offset G10 comes with an engraved pocket clip and a black gift bag included.